The crash closed Valley View Boulevard in the area. This is a roundup of all the breaking news from around the Las Vegas valley for August 23, 2018. Las Vegas police say a suspicious package was located in the mail room of the Sands Convention Center at 5:19 p.m. LVMPD's armor unit is on scene and conducting a further investigation of the package. Henderson police are investigating a fatal crash at North Pecos Road and Wigwam Parkway. The vehicle hit a pole and rolled over. The person died on scene. Pecos Road is closed down in both directions while police investigate. Las Vegas police report that only two people are injured, not three, in the crash near Charleston Boulevard and Hualapai Way. Their injuries were determined to be non-life-threatening. Police also said four vehicles were involved. 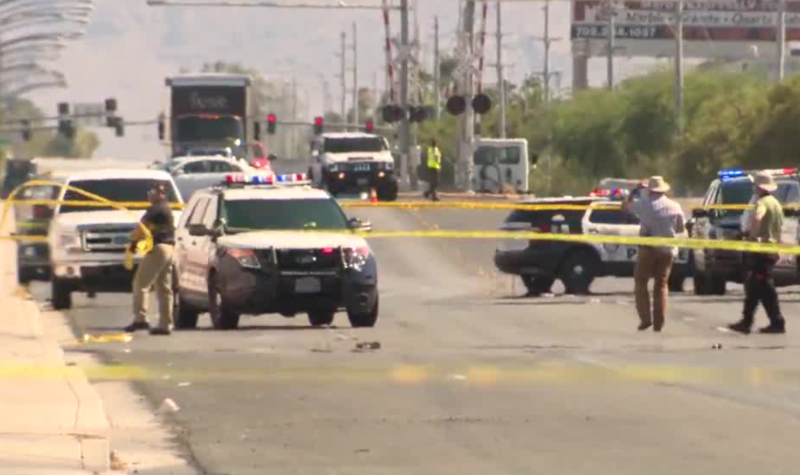 Las Vegas police are investigating a fatal collision that was reported at 2:13 p.m. at the intersection of Valley View Boulevard and Oquendo Road involving two vehicles. Valley View is closed in both directions between Sunset and Russell roads. At least three people have been injured in a two-vehicle crash near Charleston Boulevard and Hualapai Way. Expect delays in the area. 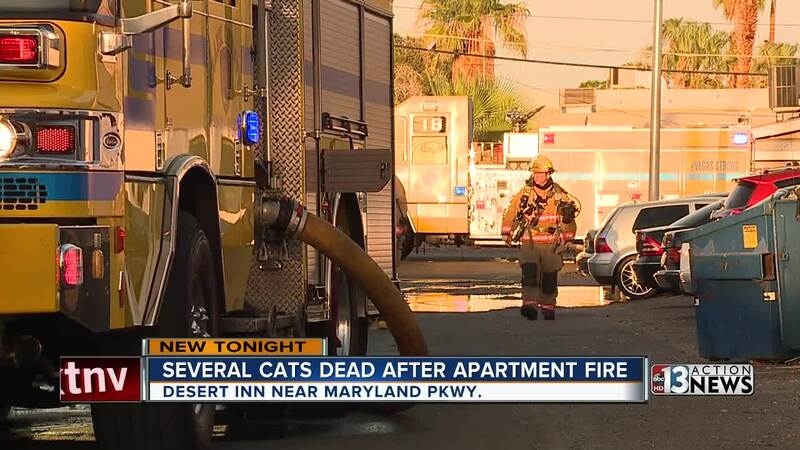 The Clark County Fire Department responded to a report of a fire in the 2100 block of North Nellis Boulevard, near Lake Mead Boulevard. Upon arrival, personnel reported light smoke coming from a single-story motel/apartment complex. Firefighters made entry to the room and found no active fire. However, one adult and three children were transported to University Medical Center and were described as stable. Damages have not been estimated. American Red Cross was requested to the scene for four adults and six children displaced as a result of the incident. A man is in custody after a domestic disturbance call in the 5200 block of East Charleston Boulevard, near Nellis Boulevard. A man had a gun and was threatening to harm himself. When police arrived, the man started yelling from the top of the staircase. Nearby apartments were evacuated. No injuries were reported. There are road closures in effect near Sunset Road and Whitney Ranch because of a suspicious water jug. The fire department is on the scene. Contrary to an earlier report, 10 students were transported to Sunrise Hospital after an earlier crash near Sahara Avenue and 6th Street. Eight students came via private vehicle and two students by ambulance. The students were heading to John S. Park Elementary School. A Clark County School District bus driver was transported to the hospital with possible neck and back injuries after a crash with another vehicle near Sahara Avenue and 6th Street. None of the 50 students on board the bus were injured. CCSD police said the students were being transported on another bus. Las Vegas police are investigating an incident on Walnut Road near Cheyenne Avenue and Las Vegas Boulevard. Police say they were initially told someone was struck by a car but medical personnel discovered several gunshot wounds. No information about a possible suspect is available at this time.